With that common name, maybe not, but I have, and frequently. In fact they are one of my favourite genera when I visit the mountains. Of course not all Pedicularis (to give them their proper name) are beautiful and garden-worthy, but some of them certainly are. 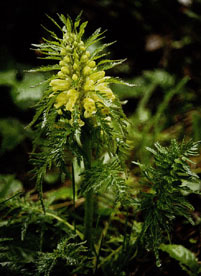 Pedicularis is a circumpolar genus of the snapdragon family (Scrophulariaceae) consisting of perhaps 500 hemiparasitic species and we have two species in the wild here but neither are particularly striking (P. sylvatica (meadow) and P. palustra (damp ground)). They got their common name from a belief that the plant in the meadows somehow gave cattle lice. Yes I know, the suffix ‘wort’ means ‘cure’ or ‘treatment’ but farmers thought otherwise. They are probably quite rare because farmers have rooted them out, as they have Hemlock Water Dropwort. However, herbalists use them as tranquilizers, muscle relaxants, powerful aphrodisiacs, and sedatives – an amazing plant altogether. 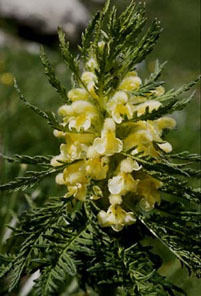 (in the Carpathians a similar plant is P. hacquetica). This has creamy yellow flowers with bright green foliage and gets its name from the leaves that extend out from between the flowers. Both these species are mid-height. One of the most lovely species is a North American one called P. groenlandica and known as ‘Elephants Heads’ for an obvious reason. 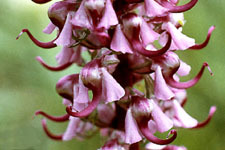 It is tall and also likes to grow in marshy ground or by water in California and the Rocky Mountains. P. oederi is a circumpolar species (found all over the northern hemisphere). A small, upland meadow species, the best example of it I have seen was in the upland tundra of the Beartooth Plateau in Montana, in the Rocky Mountains, and is the one pictured here. It is equally at home on a grassy slope on Männlichen, above the Lauterbrunnen Valley in Switzerland or in the Tatra Mountains in Poland. 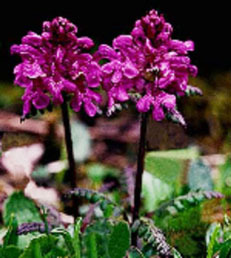 It differs from other species in that all the flowers rise from the centre of the plant leading to it resembling a posy. 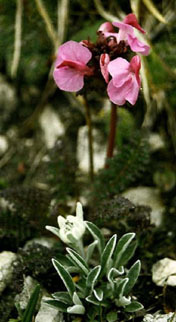 Small, higher alpine species include P. rosea and P. kerneri both of which are rosy pink with reddish leaves when in the open. 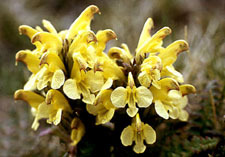 They are usually about 3-4 inches, have large flowers for their height, and frequently grow on stony ground – perhaps a candidate for the scree. It is pictured here growing with a young Leontopodium alpinum. There are many other species some of which are very attractive. There are, naturally, a great many I have never seen. Of course, if they are so all-fired attractive why aren’t we growing them in our gardens? Seems they are difficult, perhaps semi-parasitic, though no one knows exactly on what it is parasitic. It seems that if a plant is very attractive but is seldom seen in cultivation, there must be some snag. Maybe the only way to see these gems is to go and visit them at home - their home, that is. All the photographs are of plants in the wild. At the moment I have a couple of them in the garden and hope they survive long enough to flower (or survive at all). Time will tell.